Produced and mixed by Ed Stasium. Engineered by Paul Hamingson. It’s been years since I last listened to Junkyard‘s Sixes, Sevens & Nines, so I was looking forward to revisiting the album courtesy of a Bad Reputation ‘Collector Reissue’. This release faltered back in 1991, and in hindsight you can understand why — whereas Junkyard‘s self-titled debut was a high-energy sleaze fest, this sophomore effort was far more laid-back in its approach. While the group found some minor success on their debut with the nasty singles “Hollywood” and “Blooze”, they followed those up with “All The Time In The World” — a great guitar-oriented number, but one that had little in common with those earlier sleaze anthems. The song itself is great and conjures up images of the band members relaxing on the couch with a beer in hand and just enjoying life — but the opening track “Back On The Streets” would have been a more logical choice for Sixes, Sevens & Nines‘ opening single. I had forgotten how much I enjoyed this album, mainly because it displayed a sense of rhythm and swagger that wasn’t as evident on the debut. Instead of being full-throttle and cranky, Junkyard sounded like they were having fun this time around. Singer David Roach was still belting it out with his signature sneer, but this time around the guitar duo of Chris Gates and Brian Baker were determined to steal the show — and they did a hell of a job. Along with “All The Time In The World”, “Give The Devil His Due” and “Misery Loves Company” (complete with some piano work) showcased a more mature band with an exceptional sense of rhythm and blues. “Killing Time” and “Clean The Dirt”, for better or worse, were allowing the guys to break free from the typical ’80s sleaze sounds. Meanwhile it was “Back On The Streets”, “Nowhere To Go But Down”, “Throw It All Away” and the perfect album closer “Lost In The City” that followed the formula Junkyard had become noted for when they first burst upon the scene. As for this ‘Collectors Reissue’, it comes complete with eight bonus tracks, including the previously unreleased “Too Late To Save Me” and “This Trouble” — both of which are excellent additions to the Junkyard catalog. 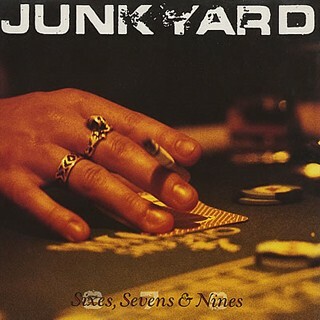 If Junkyard‘s 1989 debut was the sound of a cantankerous band nursing a wicked hangover, Sixes, Sevens & Nines was the relaxing drink-a-thon that caused the next morning’s pissy attitude. It’s a shame this record was overlooked when it first arrived because it is a great effort. Maybe it was too ‘nice’ for some fans who were awaiting a “Blooze” rehash, but overall it was very satisfying — and still is some twenty years later!